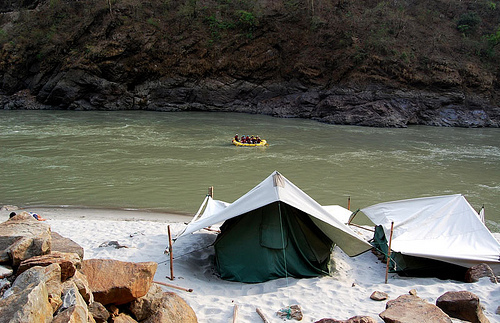 The National Green Tribunal has put a complete ban on camping activities from Kaudiliya to Rishikesh on the banks of river Ganga in Uttarakhand. The ban, that is effective immediately, will continue till the regulatory regime comes in force. The green court also banned the use of plastic in the entire stretch. It has, however, allowed the rafting activities. The order was passed in response to a petition by non-profit Social Action for Forest and Environment (SAFE) and Jaswinder Singh, a local resident, filed this year. Rafting activity has been very popular since late 1980s. In 1990, the state government of Uttar Pradesh started issuing license for rafting. In the same year, Indian Association of Professional Rafting Outfitters (IAPRO) was formed. Currently, there are 70 rafting and camping operators under the association. The area under camps, between the Kaudiyala and Rishikesh stretch, has increased 90 times in almost one decade starting from 1994. The activity provides employment to around 5,000 locals, according to the camp operators. As per the latest judgement, a six-member committee will be formed, under member secretary, Uttarakhand Environment Protection and Pollution Control Board, to help develop a regulatory regime. "The committee shall consider all aspects of environment, wildlife, river and biodiversity while preparing the relevant regulatory regime," the bench said. It will also give recommendations for preventive and curative measures to ensure least disturbance to wildlife, environment and ecology. The committee will identify the sites which can be appropriately used for camping activity and the methodology in which for carrying on of these activities. The green court has asked the Uttarakhand government to abide by the statement it had made before the court previously. The state had said in March that it would not issue new licences. The judgement was welcomed by Vikrant Tongad, the president of SAFE. “The court order should be well implemented otherwise the purpose will become dilute,” he added.